TMJ Dentist Dr. Green, LVI fellow in Springfield, MO treats TMD and TMJ pain through a physiologic, non-surgical approach. Randi Green DMD, LVIF is a TMJ Doctor near you that uses the science of physiologic-based dentistry to evaluate and treat TMD disorder by considering how your muscles, teeth, and joints all work together. Find out how TMJ can cause havoc if just slightly misaligned. TMJ Dentist, Doctor Randi Green uses the science of Physiologic-Based Dentistry to evaluate and treat TMJ disorder by considering how your muscles, teeth, jaw joints and jaw movement all work together in harmony. TMJ treatment can vary from one practitioner to another. LVI Fellow, and TMJ dentist, Dr. Randi Green has advanced training to help those with TMJ pain and symptoms by treating them through a non-surgical physiologic approach. She has helped many people throughout the Midwest regain a better quality of life through successful TMJ treatment outcomes. Contact the smile team to make a reservation. These are the 16 most frequently asked questions from Dr. Randi Green’s patients about TMJ and TMJ disorder. Watch Dr. Green’s TMJ videos. The answers might surprise you. When your bite is not in sync with the muscles of your jaw, symptoms such as headaches, jaw pain, limited jaw openings, neck pain, jaw clicking, jaw popping, grinding teeth and breakdown of the teeth can occur. Physiologic dentistry considers the entire system that controls the positioning and function of your jaw and neck. Physiologic or TMJ dentists that treat TMD disorder and TMJ pain use state-of-the-art computer systems and other precise electronic dental instrumentation to measure facial muscles to treat TMJ pain relief. Any hopefully limit or eliminate the pain from other related TMJ symptoms. TMJ success stories come in many forms. See Dr. Randi Green’s podcasts, videos, and interviews with recent TMJ pain patients. Listen to Dr. Green's patient Arwen as she shares her story and battle with the "big ugly beast" that was her TMJ pain. Hear her describe what it's like to go through TMJ treatment with Dr. Green now living life pain-free. Watch Dave's interview and hear him describe the struggles with TMJ pain. Dr. Randi Green and the smile team helped Dave to relieve him of his debilitating jaw pain and TMJ symptoms with physiologic dentistry. Ruth Ann wanted answers for her TMJ related pain. Watch her TMJ pain success story and see how how Dr. Green was able to eliminate her painful symptoms. Cindy had experienced TMD symptoms all of her life and lived through the pain. It was an article from Dr. Green's blog that caught her attention after a specific TMJ symptom left her searching for answers. Are you experiencing any of the following TMJ symptoms? If so, they could be caused by TMJ dysfunction. What is my bad bite is doing to me? This short TMJ video illustrates the concept of how Dr. Green approaches and treats TMJ disorder (TMD). She is the only LVI fellow practicing in Springfield, MO and has successfully treated many patients resolving years of chronic pain through a non-surgical TMJ treatment approach. Please watch to learn more about how a bad bite can wreak havoc on the muscles and joints! Your teeth fit together like a puzzle — there is only one way that they fit perfectly. TMJ dentist, Dr. Green is a physiologic-based dentist that can help you find your perfect smile. The temporomandibular joints, or TMJ, can cause havoc to your body when even just slightly misaligned. Clenching and teeth grinding can make things worse by placing stress on the jaw joints causing inflammation. Your facial muscles can even become torqued and strained while trying to hold the jaw in the position necessary for everyday functions such as chewing and swallowing. Severe facial pain and migraine headaches can be treated by bringing your jaw joints, muscles and teeth into harmony. Dr. Green helps patients answer these posture-related questions with physiologic dentistry. Whole health dentistry with Dr. Randi Green factors in the mouth and body connection. 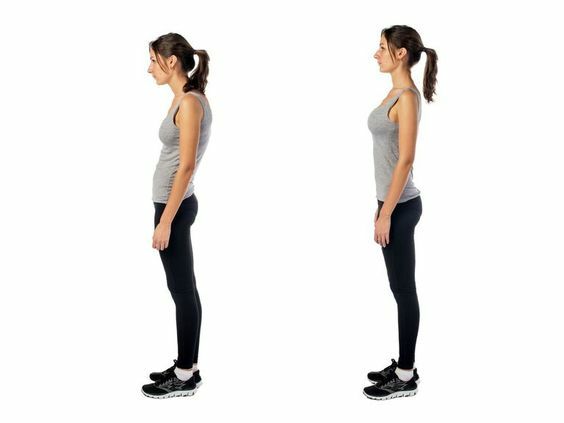 Can you correct forward head posture (FHP)? Can you improve bad sitting and standing posture? Why is my head in front of my shoulders? The effects of TMD can trickle down the rest of the body affecting posture. These postural effects can cause skeletal changes over time like rotations of the vertebrae, loss of curvature in the neck, forward head posture, tilted pelvis, and tight calf muscles to name a few. Read Dr. Green's article about TMJ and Airway and how they effect development. TMJ dentist, Doctor Randi Green approaches dentistry with a whole-health philosophy. In addition to beautiful, straight teeth, Dr. Green can also treat forward head posture and jaw area. Achieving optimal health may include treating gum disease, screening for sleep disorders such as sleep apnea and sleep bruxism, and provide patients with ideal oral health for a better quality of life. The torque and strain in your facial muscles often times leads you to change your posture to compensate. This posture change can lead to an increase of stress and strain in the head, neck and back muscles leading to pain and dysfunction in these areas of the body. With the use of smartphones and tablets, "text neck" also referred to as "tech neck" issues are becoming more prevalent. Any activity that places added pressure on your neck, such as looking down at a smartphone for long periods of time, can exacerbate TMJ pain symptoms and can cause further posture issues. TMJ disorder is common and can often go undiagnosed. TMJ dentist, Dr. Green, with advanced physiologic TMJ training, screens every patient for temporomandibular joint disorders. It can often present with no pain with the only signs being breaking, chipping, or worn teeth. If Dr. Green determines in her exam that TMJ dysfunction exists, then she will help formulate a non-surgical treatment plan to help relieve your pain. This plan often includes two phases of TMJ treatment—the first phase (Phase I) is a reversible therapy and consists of an oral appliance sometimes referred to as a neuromuscular orthotic or physiologic orthotic. This custom-made orthotic helps align your jaw joint to its proper physiologic position. Dr. Green uses relaxing techniques on the jaw muscles that help find the optimal position. There are many treatment options for the second phase (Phase II) of Dr. Green's TMJ therapy. She will review which options are best suited for your situation.